The 200-ton, building-sized Telharmonium original produced some of the first electronic music. But now it’s a compact modern synth module, too. The Make Noise/Tom Erbe Telharmonic is emblematic perhaps of how synthesizer history now folds in on itself. The module combines analog and digital control and synthesis, and pairs a well-known modular creator with one of recent years’ best known engineers and teachers of digital synthesis. Put those elements together, and you recreate… a giant electro-mechanical instrument patented in 1897, but in a form that has never existed before. That old progression from past to present to future seems so boring now. Instead, we have a wormhole of simultaneous possibilities. You know, in a good way. But if turn-of-the-last-century pioneering instruments are being made into compact modules, we also need a different kind of history. Kyiv, Ukraine-based composer/artist Oleg Shpudeiko – aka Heinali – recently wove together a history of the original Telharmonium and the new Telharmonic module. It’s such a lovely read that I felt it shouldn’t live only on The FaceBook. So here it is, preserved for posterity (and, if you like, further comments and thoughts). Thanks to Oleg for this. -Ed. 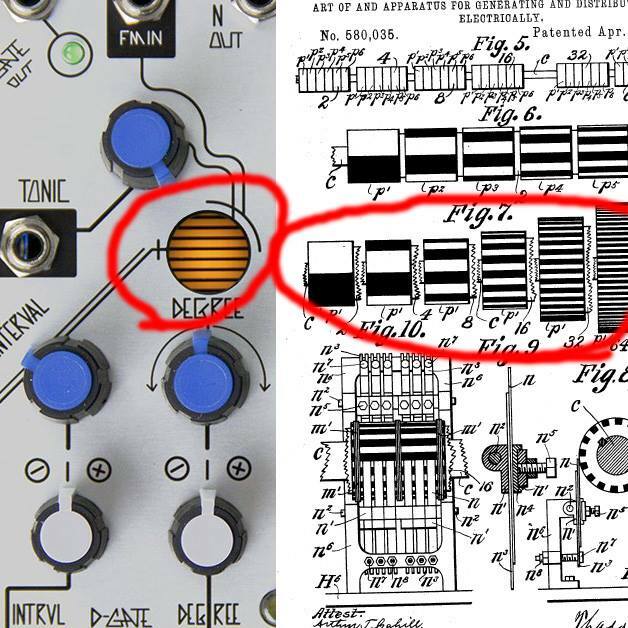 Make Noise Telharmonic and electronic music history. I’ve been considering writing about Make Noise/Tom Erbe Telharmonic for some time now. There’s an abundance of videos covering this module, of course. But regrettably, I couldn’t find any that go beyond technical demonstrations, in order to cover the module’s historical and ideological contexts (except for the original Make Noise demo videos, to a certain extent). In my opinion, those are the very things (apart from the hardware’s great sound) that make it a truly exceptional work of tech art. My text is by no means comprehensive, but I hope to accentuate some of my points of interest. 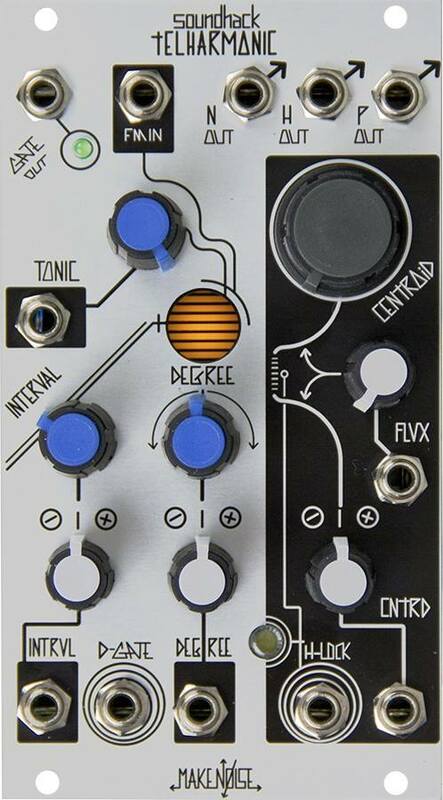 Telharmonic is an Eurorack synthesizer module, a product of collaboration between Make Noise and Tom Erbe. Make Noise is the modular synth company from the US founded by self-taught electronic musical instrument designer Tony Rolando. Tom Erbe is a University of California Santa Davis (UCSD) computer music professor, and author of the famous Soundhack sound processing software for Mac and PC. The module is described as a ‘Multi-Voice, Multi-Algorithm synthesizer module named for the music hall considered by some to be the location of the first electronic music concerts.’ So lets start with the name, because it’s by no means neither accidental, nor just a simple homage. 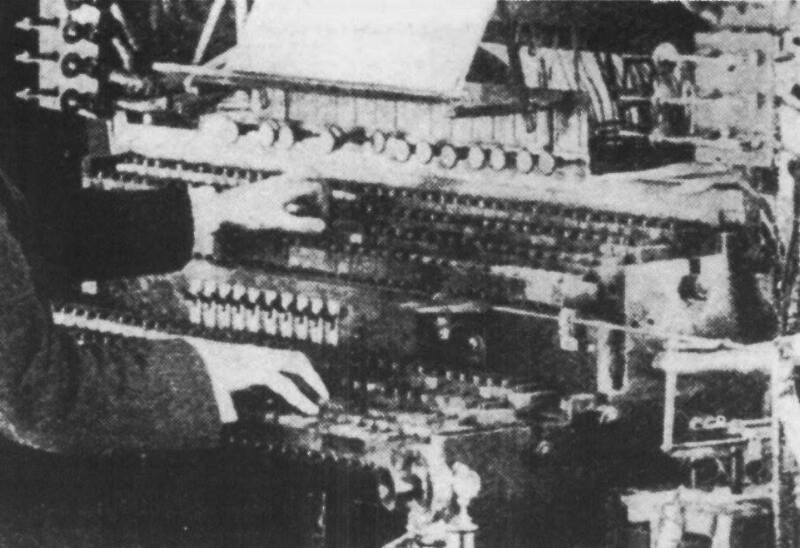 Tadeus Cahill’s Telharmonium, also known as Dynamophone, could be described as the first synthesizer, or at least the first electronic music instrument of big significance. Patented in 1897, the instrument was established in Telharmonic Hall in New York in 1906. The hall was a special concert space with an auditorium on the first floor and a basement fully occupied by instrument’s machinery. (The Mark I weighed 7 tons; Mark II and III weighed 200 tons). 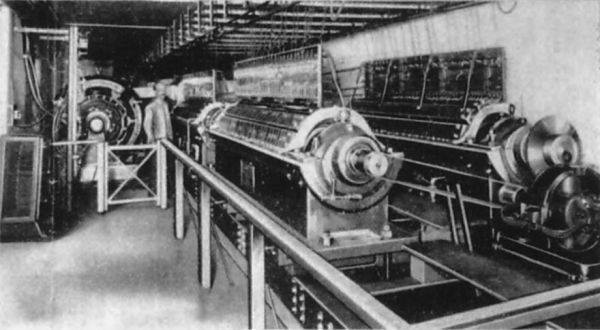 Two of the tone rotors of the MkII Telharmonium in the basement of Telhamronic Hall circa 1906. Image from McCLure’s Magazine, 1906. Performances took place in the hall, with a performer sitting behind an organ-like keyboard manual. Music emenated from loudspeakers and was simultaneously transmitted via telephone wires to subscribers in the city. 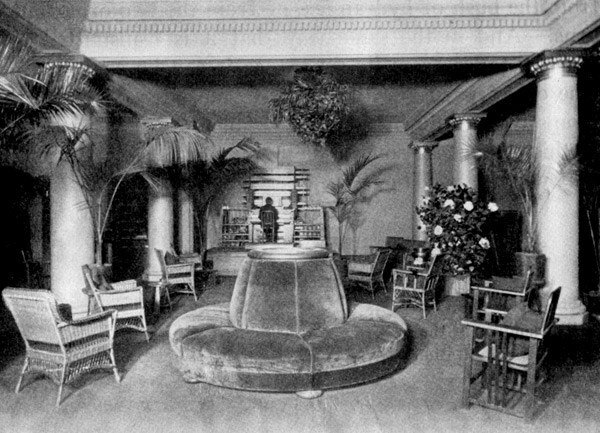 Telharmonic Hall, New York City, circa 1906. 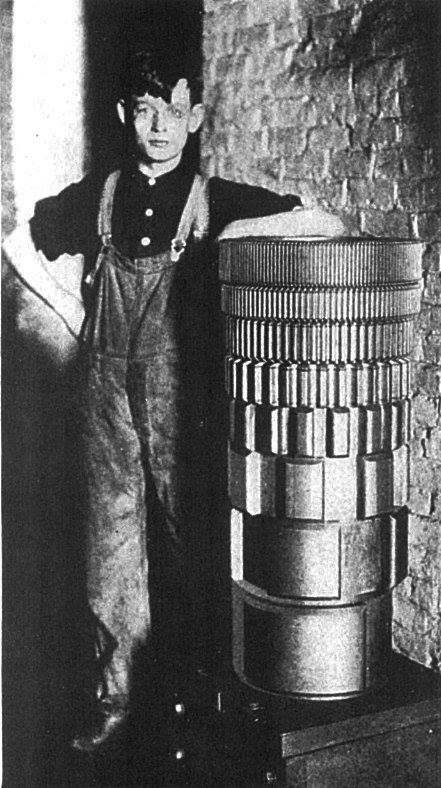 One of the massive rotors that produced tones via electromagnetic field. The bottom rotor would produce a fundamental frequency and each other rotor above it would produce a partial. The MakeNoise reinterpertation of this design subtly alludes to the tonewheel, as could be seen in Cahill’s original patents. The Telharmonium’s original additive synthesis, with sine wave fundamental and partials, is implemented is the MakeNoise module’s H-voice. As in Cahill’s tonewheels, it’s possible to shape the tone by choosing sine wave partials. However, unlike Telharmonium’s original 8 alternators, the digital H-voice features 24 partials for each of its three voices. Each partial can be brought forward by moving the Centroid knob and then locked in place (so it will continue to sound louder) by pressing the H-lock button. In the original Telharmoninium, partials were controlled by organ-like stops near the performer’s keyboard. The Telharmonium’s organ-style keyboard manual and stops. Three H-voices can be arranged in a major, minor, or diminished chords, with inversions, a fifth, unison, or octave, and microtonal combinations in between. Another parameter that develops the idea further is the Flux knob. In its fully clockwise position, it focuses on a particular partial chosen by the Centroid knob. Moving counterclockwise, it brings forward more of the neighboring partials, until all of them are present in the fully counterclockwise position. 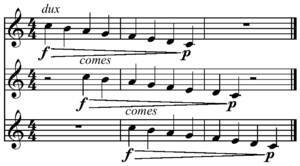 The first impression the music makes upon the listener is its singular difference from any music ever heard before: in the fullness, roundness, completeness, of its tones. And truly it is different and more perfect: but strangely enough, while it possesses ranges of tones all its own, it can be made to imitate closely other musical instruments: the flute, oboe, bugle, French horn and ‘cello best of all, the piano and violin not as yet so perfectly. Ask the players for fife music and they play Dixie for you with the squealing of the pipes deceptively perfect. Indeed, the performer upon this marvelous machine, as I shall explain later, can “build up” any sort of tone he wishes : he can produce the perfect note of the flute or the imperfect note of the piano — though the present machine is not adapted to the production of all sorts of music, as future and more extensive machines may be. Let’s now move 55 years in the future. It’s 1961, and a young composer named James Tenney produced his first computer music piece ‘Analog #1 (Noise Study)’ inside Bell Labs, using Max Matthew’s Music III sound synthesis software. My first composition using computer-generated sounds was the piece called Analog #1: Noise Study, completed in December, 1961. The idea for the Noise Study developed in the following way: For several months I had been driving to New York City in the evening, returning to the Labs the next morning by way of the heavily traveled Route 22 and the Holland Tunnel. This circuit was made as often as three times every week, and the drive was always an exhausting, nerve-wracking experience, fast, furious, and “noisy.” The sounds of the traffic — especially in the tunnel — were usually so loud and continuous that, for example, it was impossible to maintain a conversation with a companion. It is an experience that is familiar to many people, of course. But then something else happened, which is perhaps not so familiar to others. One day I found myself listening to these sounds, instead of trying to ignore them as usual. The activity of listening, attentively, to “non-musical,” environmental sounds was not new to me — my esthetic attitude for several years had been that these were potential musical material — but in this particular context I had not yet done this. When I did, finally, begin to listen, the sounds of the traffic became so interesting that the trip was no longer a thing to be dreaded and gotten through as quickly as possible. From then on, I actually looked forward to it as a source of new perceptual insights. Gradually, I learned to hear these sounds more acutely, to follow the evolution of single elements within the total sonorous “mass,” to feel, kinesthetically, the characteristic rhythmic articulations of the various elements in combination, etc. Then I began to try to analyze the sounds, aurally, to estimate what their physical properties might be — drawing 5 upon what I already knew of acoustics and the correlation of the physical and the subjective attributes of sound. From this image, then, of traffic noises — and especially those heard in the tunnel, where the overall sonority is richer, denser, and the changes are mostly very gradual — I began to conceive a musical composition that not only used sound elements similar to these, but manifested similarly gradual changes in sonority. I thought also of the sound of the ocean surf — in many ways like tunnel traffic sounds — and some of the qualities of this did ultimately manifest themselves in the Noise Study. I did not want the quasi-periodic nature of the sea sounds in the piece however, and this was carefully avoided in the composition process. Instead, I wanted the aperiodic, “asymmetrical” kind of rhythmic flow that was characteristic of the traffic sounds. The Telharmonic N-voice works in a very similar way, employing two band-limited noise sidebands around the central frequency by Tonic and Degree knobs, with a Flux knob controlling the width of the sidebands, resulting in a fluttering, almost sine-like sound in the full clockwise position, and pure white noise in the counterclockwise position. To simplify, phase distortion is very similar to FM, though instead of frequency, the phase of the signal is modulated. The Telharmonic P-voice features 3 phase-locked sine-wave oscillators –two of them are modulators, one is a carrier. By moving the Centroid knob, the frequency ratio is changed. The Flux knob controls the depth of the modulation. All three Telharmonic voices — H, P and N — can be used simultaneously in any combination, with Centroid and Flux controls affecting the spectral content of the voices, while Degree and Tonic controls affect the voice’s intervals and pitch. Apart from the main mode of operation described above, Telharmonic has two hidden modes, switched by holding the H-lock button for several seconds. The first one is the ASR emulation. 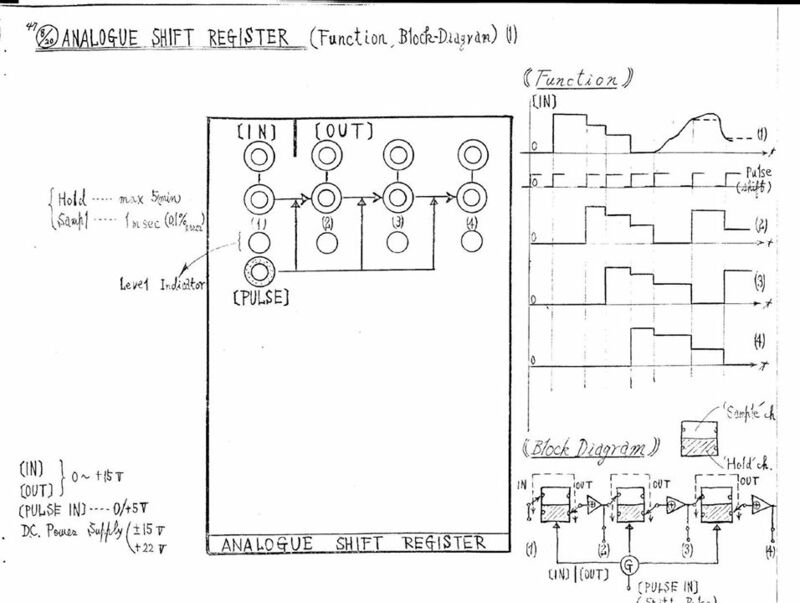 ASR stands for analogue shift register, which is basically a more complex sample and hold circuit, or, in classical musical terms, a canon generator. For example, a three-voice ASR would have two inputs and three outputs. The first input takes the signal which is sampled and ‘memorized’ every time it receives a pulse in its second input (clock). The first time it receives the pulse, it outputs the memorized signal from the first output; the second time, it outputs the voltage from the second output and memorizes the next voltage and outputs it from the first output. The third time, the first voltage is sent to the third output, the second outputs from the second, and the new (third) voltage is being sampled, stored, and sent through the first output, and so on. In this way, the process generates a simple canon, like, for example, Row your boat. A simple canon, in score form. The ANALOG SHIFT REGISTER is a sequential sample and hold module for producing arabesque-like forms in musical space. Whenever pulsed, the previously held voltage is sent down the line to three consecutive outputs to produce the electrical equivalent of a canonic musical structure. The Telharmonic digital ASR module features three channels, with P, H and N voices available simultaneously, as well as six quantization modes, selectable by Interval knob: suspended chord, major triad, minor triad, octaves and fifths, chromatic, octaves only. The second Telharmonic hidden mode is the Spiratone, a Shepard tone generator. The Shepard tone, named after Roger Shepard, a cognitive scientist, is an auditory illusion of a tone that continually ascends or descends in pitch, yet never moves away or resolves. It was inspired by two particular compositions, Jean-Claude Risset’s “Computer Suite from Little Boy: Fall” of 1968 and aforementioned James Tenney’s “For Ann (rising)” of 1969. Pretty much every experience with Telharmonic could become an interaction with some of the most interesting moments and ideas of electronic music history. Cahill’s Telharmonium and additive synthesis, half-forgotten phase modulation synthesis of the 80s, Tenney’s first computer music, Serge’s ASR, Shepard’s tones … all of these are interconnected, all housed in a small, 14hp, 30mm module. If you have any corrections or additions for this piece, please feel free to contact me.